Vision To Learn recently reached a significant milestone: Our organization has helped more than 100,000 children in more than 220 cities across the country. Helping 100,000 kids is just the beginning. 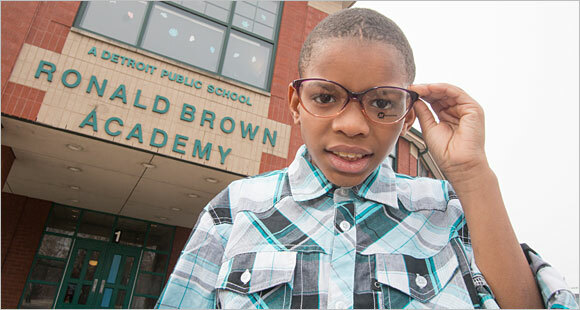 Our mission is to help all children get the glasses they need to succeed in school and in life. We are just getting started. On February 23, Vision To Learn held events in Northern California in celebration of our 100,000 milestone.David Plouffe, President of Policy and Advocacy for the Chan Zuckerberg Initiative, and Vision To Learn founder Austin Beutner spoke to an excited group of kids assembled at Ronald McNair Academy in the Ravenswood City School District. The Warriors Dance Team was on hand for the occasion as well, to represent the Warriors Community Foundation which has provided support to Vision To Learn. The Chan Zuckerberg Initiative has provided grant funding to support Vision To Learn’s programs in the nine-county Bay Area and Sacramento and its expansion to new communities. David Plouffe of Chan Zuckerberg Initiative, Austin Beutner, and members of the Golden State Warriors Dance Team. Vision To Learn’s Northern California Mobile Clinic at Garfield Elementary. On February 24, 2018 children from Garfield Elementary School in Oakland had the experience of their young lives when the Golden State Warriors Foundation hosted them at Oracle Arena for the Warriors’ matchup with the Oklahoma City Thunder. The students, who had received glasses from Vision To Learn, were invited to celebrate the foundation’s partnership with VTL in the Hoops 4 Kids program. The students enjoyed a tour of the arena, including areas where the players prepare and eat pre-game meals. The group sat courtside during warm-ups, watching Warriors all-stars Steph Curry, Kevin Durant and Klay Thompson shoot around before the game; and then watched all the action during the match-up with Oklahoma City. During halftime, a video about the Warriors-Vision To Learn partnership played on the jumbo-tron. Following the video, the cameras went to a live feed of the kids in their new glasses, whooping and hollering with delight. The age-old saying “It takes a village to raise a child” does not fall flat in Iowa. In fact, it’s quite the opposite. Many community partners are working together with Vision To Learn to ensure students are provided with essential tools to be successful in school. In Des Moines, a Vision To Learn partnership with the United Way of Central Iowa, the local school district, and Prevent Blindness Iowa serves students in grades K-5. The United Way raised funds to support the project, and Prevent Blindness Iowa assisted in administering vision screenings for over 6,000 students within the Des Moines Public School District. “This innovative program is another way we are mobilizing our community as part of Read to Succeed, to help all children read proficiently by the end of third grade. It especially gives students a vital tool they need to learn; and ultimately, to graduate from high school,” said Elisabeth Buck, President, United Way of Central Iowa. Students from Lovejoy Elementary in Des Moines, IA with representatives from United Way of Central Iowa, Prevent Blindness Iowa, Des Moines Public Schools, and the Community Foundation of Greater Des Moines. with a student from Oakland High School. Also on hand at Oakland High School was California State Assemblyman Rob Bonta, who represents the Oakland area, where VTL has helped about 1,500 students in Oakland schools. “Every child should have the ability to see in order to learn,” he added. Over the next two years, every Los Angeles Unified School District student in kindergarten through 12th grade who needs a vision exam and glasses will be provided with them, free of charge. An estimated 60,000 students in this, the second-largest public school district in the country, need glasses. When it came time to help the students put on their new glasses, the 6-foot-10-inch Griffin had to bend to see eye to eye with the kids, but it didn’t matter. Everyone was all smiles. Clippers President of Business Operations Gillian Zucker, Austin Beutner, Clippers owner Steve Ballmer, and others on hand to celebrate. Inglewood, CA student Nasir Lucas addresses the crowd. “When Vision To Learn arrived, I was happy,” Nasir said. “Since I got my glasses, I’ve had no trouble looking at the board, and my grades have improved.” He has more fun on his skateboard, too, now that he can see sidewalk cracks and other obstacles in his path. 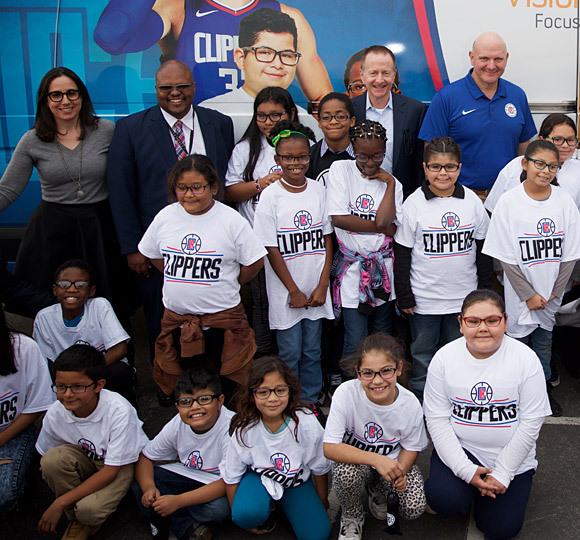 In January, 11-year-old Nasir, now a sixth-grader, enjoyed a special honor at the event spotlighting the partnership between Vision To Learn and the Los Angeles Clippers Foundation. He got to stand tall and share the podium with Blake Griffin, telling everyone in the crowd how cool his glasses are. In his State of the City address on January 9, Long Beach Mayor Robert Garcia said he was “incredibly proud” of a special partnership with Vision To Learn, which is providing eye exams and glasses for over 8,000 students in Long Beach Unified School District. Long Beach Mayor Robert Garcia and student Samantha Cuevas share the stage at the Terrace Theater in Long Beach, CA. Atlanta Hawks Cheerleaders celebrate with a student. As part of its mission to help Atlanta youth play, grow and learn, the Atlanta Hawks Foundation supports Vision To Learn, providing a Hawks-themed mobile clinic, financial support and appearances by players. “The partnership … really helps level the playing field of learning,” said Ashley Adamo, principal of Toomer Elementary. At a February event at Atlanta’s Fred A. Toomer Elementary School, Atlanta Hawks cheerleaders and their Harry the Hawk mascot revved up the crowd as more than 70 students tried on glasses for the first time. Vision To Learn and the Hawks also teamed up on March 8 at Parkside Elementary School in Atlanta to celebrate providing 1,000 Atlanta students with an eye exam and glasses. At Parkside, about 130 children received glasses, as Harry the Hawk and the Hawks cheerleaders were again on hand to elevate the celebration. 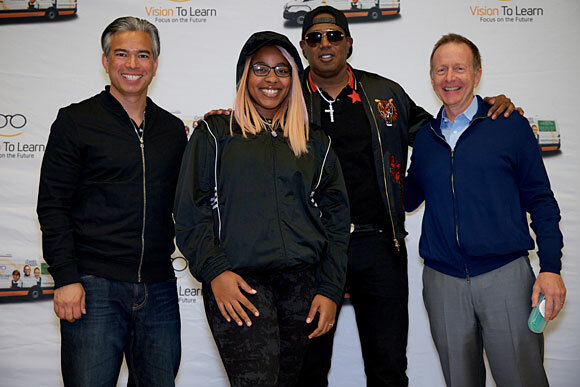 In January, Master P, Romeo Miller, and Austin Beutner popped in to Crenshaw High School’s library to help Vision To Learn provide free glasses to students. Austin Beutner, Romeo Miller, and Master P with a Crenshaw student. A Michigan student tries on a new pair of glasses. Vision To Learn’s Michigan program launched in Detroit in Fall 2016, and is expanding its effort to help kids in nearby communities of Western Wayne County. Vision To Learn will continue to serve schools in the Detroit Public Schools Community District (DPSCD), through an ongoing partnership with the Detroit Health Department. To date, Vision To Learn has helped over 4,500 kids in DPSCD. Thanks to the support of funders including the Margaret Dunning Foundation, the Detroit Pistons Foundation, the Ballmer Group, and Penske Corporation, Vision To Learn is growing its program in Michigan; and a second mobile clinic has doubled Vision To Learn’s ability to help an estimated 8,000 Michigan students annually, including the communities of Flint, Pontiac, and Livonia. Six years ago, Vision To Learn got its start in Los Angeles with one mobile vision clinic. Today it helps children in more than 220 low-income communities in 12 states, from Honolulu to Baltimore. Thanks to all of the staff, volunteers, supporters, and kids who have made this possible!